NV Energy and Control4 launch one of the largest HAN systems yet. There was no lack of consumer backlash in 2010 as utilities were taken to task over smart meter deployments and what advantages the process offers for customers. By the time the year came to a close, customer engagement was the battle cry for any utility looking to move forward with smart meter projects. The utilities have been listening. NV Energy, which is deploying 1.4 million meters by the end of 2012, will also deliver at least 20,000 Control4 energy displays and wireless thermostats to residential customers for demand response -- and hopefully to curb energy usage outside of peak events. Distributech, the big smart grid trade show, takes place this week, so expect more in this vein. Another story: BC Hydro will likely announce its smart meter partner, and the leading characters are Itron and Sensus. Customers who receive the energy management systems will allow them to voluntarily participate in demand response events. They will be able to opt in to individual events and set their own preferences regarding price and comfort. NV Energy is hoping to increase their DR portfolio by 75 megawatts using this system. Overall, the utility is looking to get upwards of 400 MW in the coming years. For Control4, the win is just another feather in its cap. 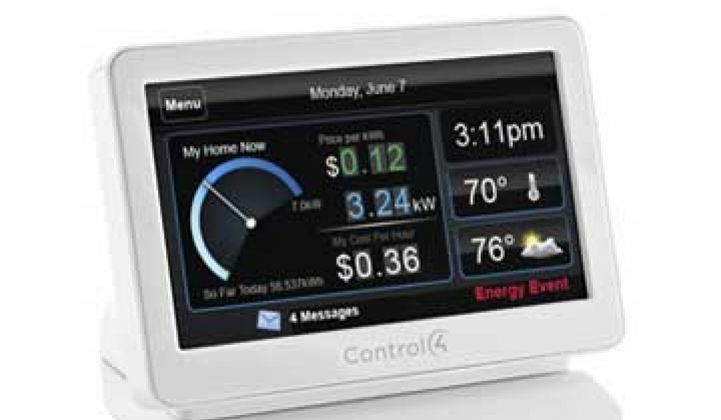 The home controls company also recently partnered with Silver Spring for its hardware to be incorporated into Silver Spring’s Smart Energy Platform. The partnership is entering a pilot with AEP Ohio for 1,000 customers. As for NV Energy, 20,000 units could be just the beginning if the product is well received. The utility has even rebranded its smart grid efforts, calling it Advanced Service Delivery -- shifting the focus to consumers instead of what smart grid technology can do for the utility. The name is almost as dry as 'smart grid,' but at least they're trying.